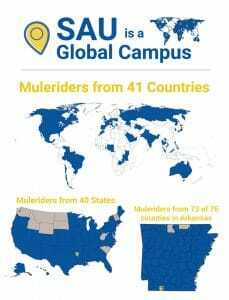 The world’s most populous country continues to hold allure for SAU alumni, but also offers promise for recruiting future Muleriders. 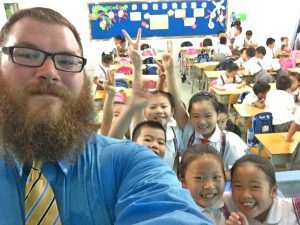 SAU alum and International Student Coordinator Jason Martisek has experienced China as an English teacher, and more recently returned to cultivate recruiting opportunities. “Last year there were over 300,000 Chinese students studying in the U.S., which makes them the largest group of international students in the U.S. If we could get just a fraction of a fraction of that, we would see tremendous growth in our Chinese population,” said Martisek. He endured a 36-hour trip to the east coast of China to meet with the University’s partners with IDP Education, an international student placement service. He said he had the opportunity to present SAU to prospective students at recruitment fairs. He also shared SAU’s selling points with IDP counselors and directors, who really appreciated how SAU has kept down costs to students. SAU is the sixth most affordable small college in the U.S. (bestvalueschools.com, 2015) and the most affordable option in Arkansas (U.S. Dept. of Education, 2015). His 15-day visit in China included travels to Shenzhen and Guangzhou, which are two large cities near Hong Kong and Shanghai. He said his best experience came unexpectedly from a short stay in Guangzhou. After a college fair, the parents of current SAU student Jun Zheng took him for dinner at a seafood restaurant in which patrons actually browsed large fish tanks to choose their catch, so to speak. Following was a ferry ride on the Pearl River to see the cityscape at night. The next morning they took him for dim sum before taking him to the airport. Martisek is no stranger to having his passport stamped. He recruited for SAU in 2012 in Hyderabad, India, which is an area that has produced unparalleled growth for SAU’s School of Graduate Studies. On that same journey he worked events in Kathmandu, Nepal, another area that has produced many Muleriders. He traveled as an SAU student to Moscow in 2006. After he graduated, he worked for almost four years as an English instructor in Wuxi, China, which allowed him opportunities to travel across the country and in Thailand. 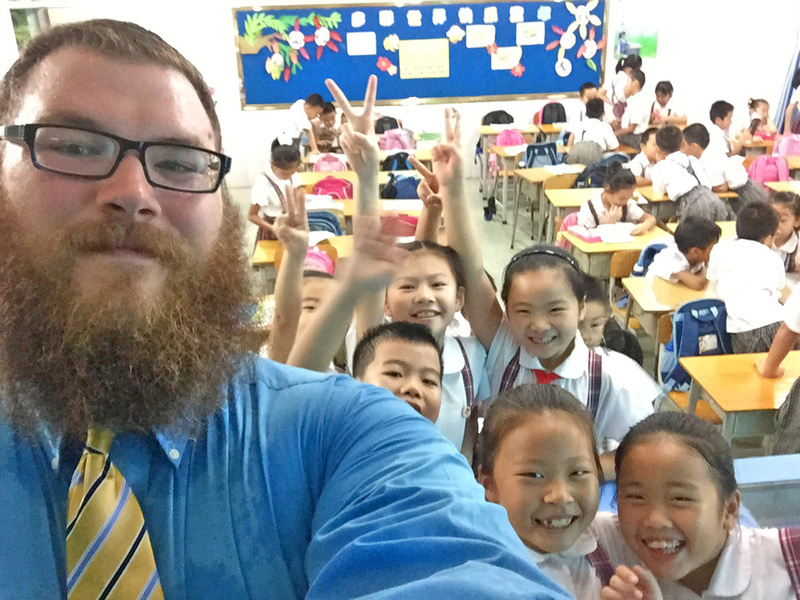 SAU graduates with a flair for adventure are following Martisek’s footsteps and taking teaching positions in China, including Mitchell Bradford and Cameron Bailey. Bradford just completed an amazing first year of working with inspiring youth and experiencing as much as possible, while Bailey was recently hired for the 2016-17 academic year. It was SAU alum and then Risen School teacher Tara Hogue (Arnold) who Bradford credits with straightening out the 6’1”, 280-pound football player and helping him realize his talent and passion for languages. He went from barely cracking his books, to excelling, then becoming a teaching assistant helping tutor middle school children. His college life at SAU consisted of many international travel and study abroad experiences, being immersed to absorb Spanish then French in Guatamala and Montreal. He taught English as a Second Language and hung out with international students at SAU, learning their languages for kicks. 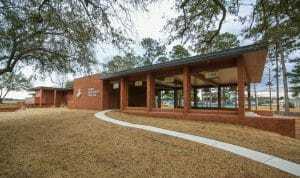 He taught Continuing Education Spanish classes and tutored Magnolia Public School students from South America. While on an SAU European Tour trip to Barcelona, his resume was discovered by hiring agents in China. He graduated in May 2015 and flew to China in August. 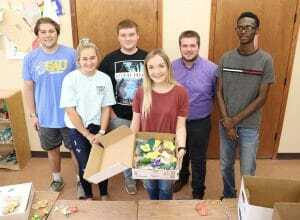 Bradford graduated high school with 36 classmates from a town of 120, and somehow found himself teaching around 1,500 students ranging from grades first through sixth. “The kids were cool, silly, normal kids. No different than the kids I was teaching in the U.S., except they were Chinese. I was the only foreign teacher in the school, so they wanted me to teach every class in every grade so the kids could practice with a native speaker,” he said. In January, he transferred to Hefei. He teaches second grade at an International Baccalaureate school where critical thinking is prioritized. “Second graders studied why water is so important to life, where it comes from, why some don’t have it…” he explained with admiration. The students even tested area lake water and wrote research papers on why it was polluted, how it can be improved. He said he habitually arrives early and leaves late to make sure everything is ready for his classes. Otherwise, he has appreciated their standard two-hour lunch, which allows for “noodles, nap, and back to work.” Two days a week he stays late in his school to study calligraphy with a group of first-grade students. As busy as Bradford may seem with his work, he’s been equally on the go traveling and soaking up the culture of China. He’s learned Kung Fu from monks at a small remote village hoisted on the side of a frigid mountain. He visited the first Buddhist temple in China (circa 200 A.D.), the Great Wall, the Forbidden City, and a giant panda breeding research base. He dined on many interesting cuisines, including pigeon at a fancy restaurant and donkey (“they say it tastes like horse”). He even went through some amount of difficulty to find and be allowed to volunteer with orphans, which he had also made a point to do previously while in Guatemala. Bailey, a senior sociology major from Nash, Texas, has been a standout leader while at SAU. He admits he doesn’t think he would be ready for a year in China had it not been for his work with SAU organizations, which hones his leadership abilities, and his studies, which peaked his interest about other cultures and societies.